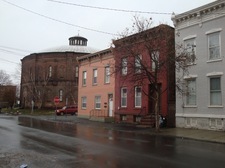 Gasholder Building, 5th Ave. at Jefferson Street, Troy. It doesn't take much to catch my eye, I guess. Just a circle among squares. 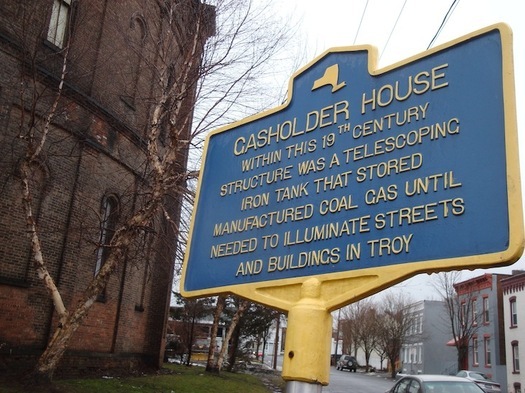 And that's exactly what's so fantastic about the Gasholder Building, 5th Ave. and Jefferson Street in South Troy. 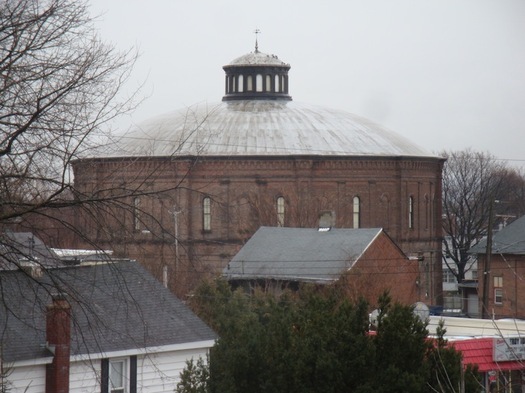 Built in 1873, the Gasholder is a landmark from Troy's Industrial Age. Its narrow, arched windows are boarded or blocked; a long vertical crack is filled with cement. The building is topped with a broken weathervane. It's beautiful. It's imposing. 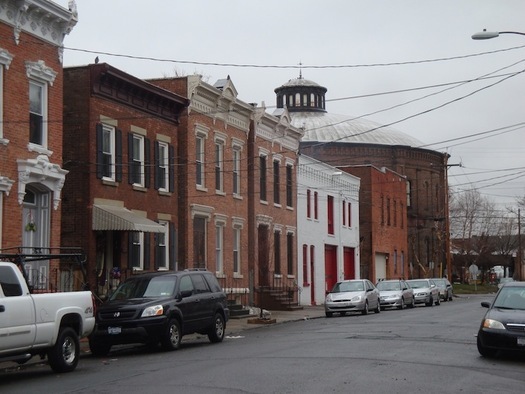 But more than that, it's a round building in a rowhouse neighborhood. The kind of thing that makes Place X different from Place Y. And for my money, you can never have too much of that. Let's start with the obvious: What was it for? Storing manufactured coal gas, the kind used for gas lighting. The operation was owned by the Troy Gas Light Company. Coal would be baked, and the resulting gases would be collected, purified and stored until they were needed to be piped into streetlamps and homes. People got used to the idea of obtaining their fuel "from the outside" -- on demand from community-wide distribution systems -- instead of from their own privately stored fuel stocks, and local governments began to see energy distribution as a valid municipal function. People also grew comfortable with gaseous fuel, something new to human experience. In these ways, the gaslight era helped pave the way for the electricity and natural gas networks that would provide most household energy in later years. The building on Fifth Ave. didn't hold gas, technically; it held the gasholder -- an iron tank inside the brick structure. This iron tank was an interesting thing. It was made of two pieces that fit together like two sections of a telescope -- if you could imagine a telescope of which each section was 22 feet high. The holder would rise and fall with the amount of gas being stored inside. An 1872 New York Times article describes it: "As the gas is let in and the pressure increases, the huge iron cylinders rise up and the inner one slides up until the holder is fully extended." And then the weight of this iron holder is what provided the pressure for the gas in the supply pipes. The building was described in the late 1960s as one of the country's largest remaining gasholder buildings, and "one of the few remaining examples of a type common in Northeastern urban areas." "Common" caught my eye: This unexpectedly round building in the middle of all these rectangles -- in the Northeast these were an ordinary neighborhood sight? Imagine our great-grandchildren, 100 years from now, stopping on a cross-country jaunt to photograph the nation's last remaining road salt dome. Taken out of context almost anything can have a curious beauty. Still operational in 1912, it was probably in use until the 1920s. The gasholder itself was removed in 1930 and sold as scrap iron. In the years since then, it's been used as storage space (by a circus manager, for a while), for marching band practice and as a garage. When I visited it Wednesday, cars were parked inside it. Most intriguing, it's been used recently as a performance space. Now that I'd like to see. Many factors affect what we preserve and what crumbles. The Gasholder Building is one I hope we keep around. The Gasholder Building has been included in the Historic American Engineering Record, a survey of significant sites in American industrial and engineering history. My source for much of this material was the building report that accompanied that record. The Library of Congress holds some beautiful black-and-white images of the building, inside and out. 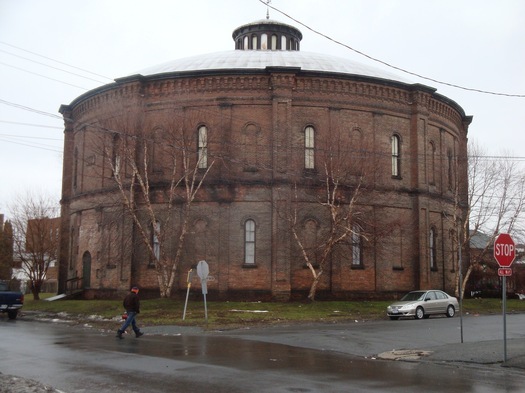 Once these structures were common, and if you see a round brick building in a city center, you should begin to wonder if it was once a gasholder. It would be great (or "Grand," as my Irish grandma would say) if it could be used like Hudson's Basilica Industria. Also interesting about this structure: Its architecture. 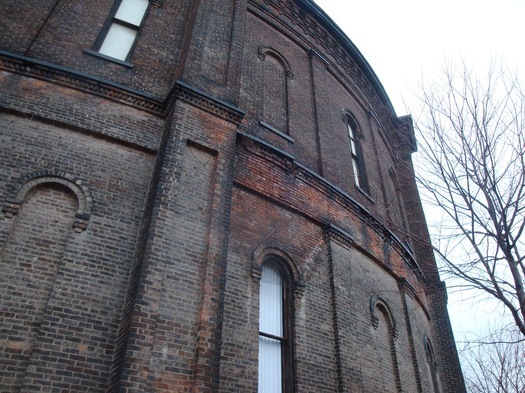 This thing was essentially bulk storage, but the brickwork is elegant and detailed, and it has a cupola. The closest analog I can think of is a water tower, yet when we put these things in today, we seldom require any sort of meaningful articulation toward public space. If this type of structure were constructed today--well, it wouldn't be; we'd just put up a high fence (for fear of terrorism) and find some non-oxidizing material to construct the storage itself, leaving it unconcealed in the name of construction cost. A wonderful piece that points up how much our collective approach to public space and public life have changed since the turn of the last century. My cousin dances with Ellen Sinopoli, and they had one of their performances there a few years back. It's a really amazing space. On an unrelated note, a friend of mine posted the soda bread post on her Facebook, bragging that she knew who the "mysterious" irisira was. Based on this post and my post on the Jimmer facts post, it would be pretty easy to track me down. Hey! That's my house! Seriously, one of the major selling points to our house was the gasholder building. I also loved that Ellen sinopoli show there a few years back. Thanks for highlighting this great building (and a sweet block). There's another one in Saratoga Springs, though that one is quite unornamented. Good to know it's still being used (even if it's just occasionally) rather than being left to rot. I've always wanted to see the inside in person! I wish I had known about that performance just a few weeks ago! Umm yeah... I just noticed that performance was three weeks and a year ago. Akum, Were you able to see the inside yourself? Many thanks to Bill Sage and the Sage Family Painters who have carefully tended the Gasholder site for many years. The are very gracious in allowing community groups and events to be held at this architectural wonder. Sever years ago Little Italy neighbors sponsored a Norman Rockwell Institute with help from the Rockwell Museum archivists. Ellen Sinopoli used the site for a dance performance. Little Italy has used the site if the weather is poor for its Cinema Under the Stars series, Community Gardens volunteers helped landscape the site, there have been light and sound performances, etc. All in a building a block from my home. Don't forget Joe Connor's terrific postcard showing the row houses of South Central/Little Italy with the Gas Holder in the Center. The view is from Prospect Park. @Paul: I had tried to track down the people to contact to get inside the place, but I wasn't able to do so before my story deadline. I'm interested to note mike esposito's comment about the Sage family -- that's not who I'd been told owned the building, so perhaps I'd been chasing a dead lead anyway. I, too, would love to see inside. I want to record in there badly. The architecture may have nice decorative touches but the whole structure was built for a very important purpose: to protect the gas holder from the elements and to make the neighbours think they were protected. If the gas holder blew up, the explosion was supposed to go up rather than out because of the brick walls. The house in Saratoga has its charms too. The floor inside the Troy Gas Holder House is sand. I guess that is what they filled the space with when they took out the tanks. How can anyone know when the gas house will have an event going? I grew up just two blocks away, on Fourth Street (Little Italy) and loved to go and hang out near the gas house. I am 62 years old now and would love to be able to go inside and see what I have been wondering all these years, what does the inside look like???? I still live in Troy! I was raised in South Troy and the Gasholder Building was such a fascinating building for me. When I was a little girl in the early 1970s, my grandmother walked me and my sister into that building and I'll never forget standing there, turning, taking in the fact of no corner walls, just massive curved walls and a ceiling so high above our heads. I was in there only that once, but seeing that building always makes me think of my grandma and that day of wonder so long ago.